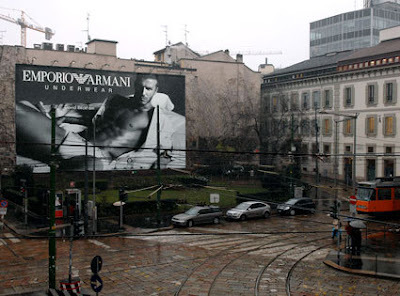 On a billboard measuring 310 square meters, Beckham made his official worldwide debut as the face of Emporio Armani underwear in Milan yesterday. The billboard can be found on via Cusani and via Broletto. This unveiling is just in time for Milan Men's Fashion Week (which starts the 12th of this month). If you happen to be in the area, be sure to check out this location. Similar billboards should be going up around the world in the coming months, so be on the lookout for those as well. If you spot one be sure to let us know. Image Source.